Engagement gifts have become increasingly common. From small trinkets to elaborate presents, engagement gifts are a way for others to congratulate a couple on their wonderful news and impending nuptials. Those who think of an engaged couple and present them with a gift deserve to receive a thank you letter for their kindness. An engagement gift thank you letter must contain an explicit message of thanks. First and foremost this thanks should be for the gift giver's thoughts of the engaged couple, and then it should encompass the actual gift that was given. Very often engagement gifts may be family heirlooms of some sort, such as a mother who gives her daughter her wedding dress or veil to wear. When gifts are heartfelt, the message thanks for them should be as well. If the gift itself is not quite what the engaged couple was hoping, then focusing on how nice it was for the gift giver to think of the present or to part with the present is a good idea. If the gift giver will be invited to the actual wedding then it is nice to end such thank you letters by referencing how much the couple is looking forward to sharing their special day with the letter recipient. However, if final guest lists have not been decided and there is any chance that the letter recipient may not be invited to the wedding ceremony or wedding reception then such a message should be avoided. Engagements are special, personal occasions so it is appropriate to thank someone for an engagement gift by sending out more personal thank you letters. This means that formal formatting is not usually appropriate for engagement gift thank you letters. Instead, these letters should be handwritten if at all possible and written on nice paper, notecards or commercial thank you cards. Engagement thank you cards may also be available for sending out such letters, and some couples even choose to send thank you letters for very early gifts with their engagement announcements. 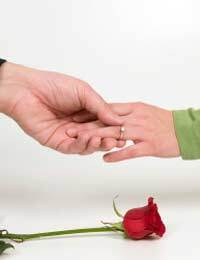 Thank you letters for engagement gifts may be posted or hand delivered, but only if they are thanking a very close friend for a very small present should they be sent electronically. These letters should be sent within one week of the engaged couple receiving the gift. We just wanted to say thank you again for the lovely crystal picture frame. Mike and I will be having our formal engagement pictures taken within the month and I can't wait to have a copy of our first official photo to show off in this frame. In fact, when we host our engagement party in early December you will be able to see the finished product first hand! Please keep the night of 7 December open for this party, and the first weekend of July open for the wedding. More details will follow when we have them, but these are our plans for now.